Flexible, one component, fiber reinforced silicate mortar with polymers. Available in white color. It presents excellent surface hardness and zero shrinkage, exceptional breathability and great workability. Suitable for repairs as well as for full restorations of wall top coat surfaces. It prevents the damaging effects of moisture penetration by creating a long lasting, water repellent coat, with thickness of up to 5mm per coat. 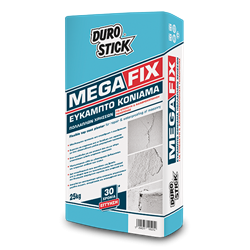 Moreover, it seals cracks from 0.5mm to 30mm wide and 40mm deep, not allowing them to reoccur. Its strong adhesion strength allows for applications even on painted surfaces made of plaster and concrete, when the paint is well adhered. It prevents carbon dioxide, sulfur or nitrogen gases to penetrate into building components. As top coat plaster, it is classified GP: CSIII/W2 per EN 998-1. As repair product, it is classified R1 per EN 1504-3.